Hello! 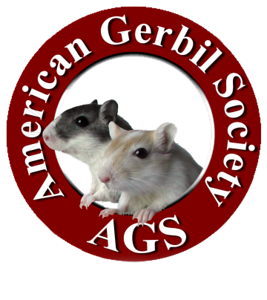 The daily tip today is to check out the American Gerbil Society! 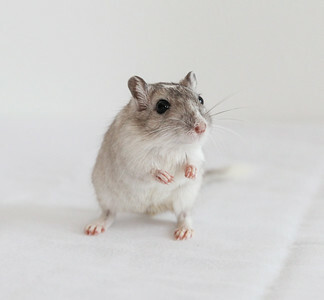 It is an amazing organization that can help you answer all of your gerbil-related questions, provide a fun community, and even offer opportunities to show your furry friends! Hello everyone! While you may have seen pictures of Kohala on our blog or social media pages, we wanted to give her a formal introduction. 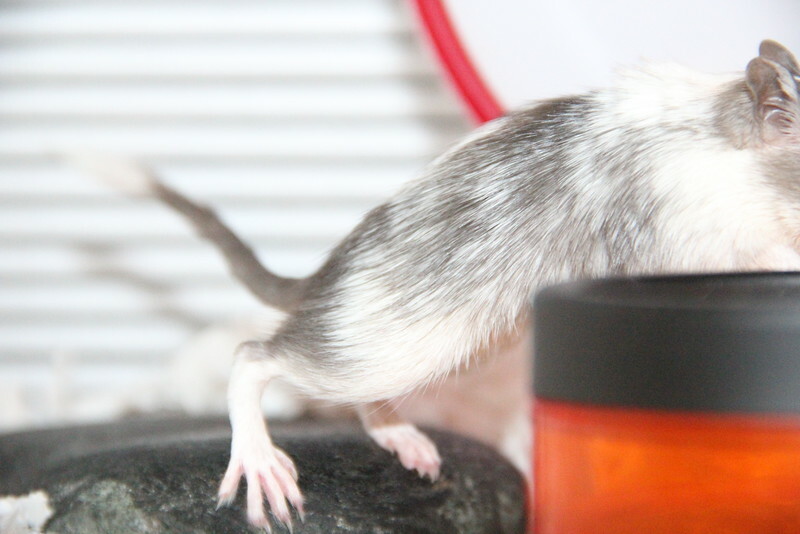 Kohala is pied silver nutmeg born on April 26, 2015. 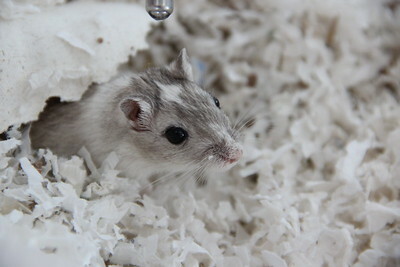 We've had her since August, and she came from another wonderful gerbil breeder, Gerbil Gems! She's the mother of our most recent litter, born in October of 2015. So welcome to our ohana (means family in Hawaiian), Kohala! Hello! Here is Niblet with his award from the 2015 American Gerbil Society Virtual Show. He took 1st place in the Breed Class: Senior. Enjoy! As the previous blog post mentions, we have some very exciting results from the American Gerbil Society Virtual Show! Here is a picture of Kohala's 3rd place ribbon in the Spot: Self Breed Class. Enjoy! * multiple photos of Rowdy were submitted for the pet class. His two photos tied for first place in the Pups & Family life category. Hello gerbil lovers! 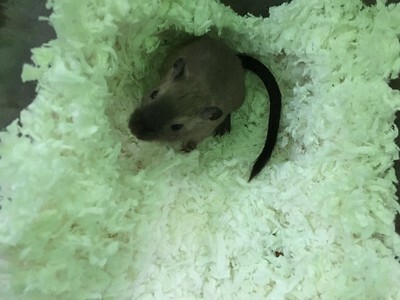 Ohana Gerbils has just created its first Twitter, Instagram, and Tumblr account. Please follows us to see exclusive gerbil pictures and find some great information. 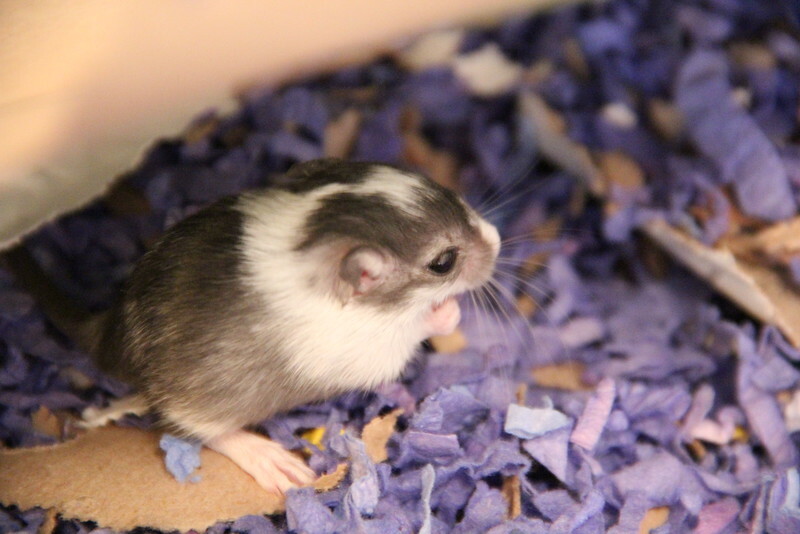 You can also check our Pinterest and Google+ account to see more adorable gerbil photos! 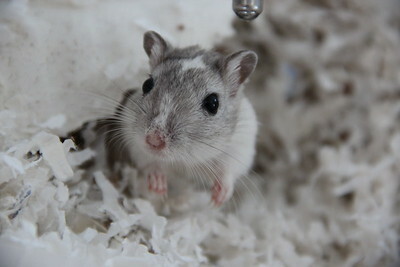 Good morning Gerbil Lovers! Happy 4th of July! Hope everyone is having an amazing day! We have many beautifully colored gerbils in our upcoming litters, and we want you to be able to correctly identify these colors. Today's blog post is on the difference between a slate and a black. A black gerbil will have a shiny black coat with no visible white hairs. Both black and slate gerbils will have black almond shaped eyes and black toenails. A slate gerbil will have greyish fur that is normally very dark. It is very easy to identify black and slate gerbils. You can use the following pictures as a guide! The first picture shows a black gerbil on the left and a slate on the right. The second picture (middle) shows a spotted black gerbil. 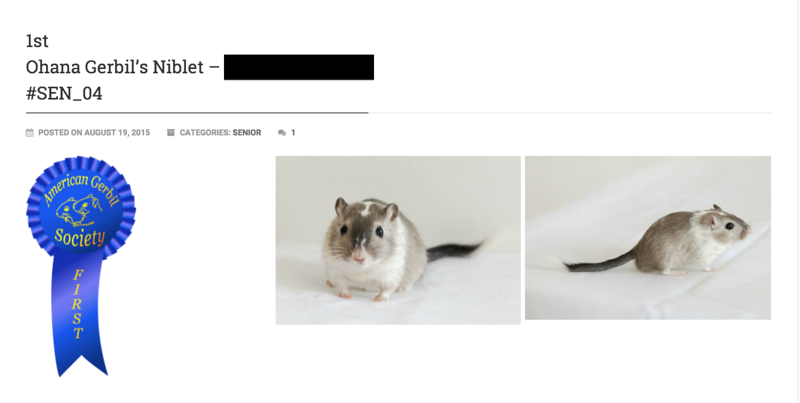 The third photo (right) shows a spotted slate gerbil. Hope this helps! Hello! Today's bonus tip applies to anyone who has active rodents. When powerful creatures run on their wheel, it often tips over and traps them underneath the plastic bulb. This could leave your gerbil without any food or water for long periods of time. A fallen wheel could also crash down onto the little gerbil and either severely hurt them or even break their neck. A very cheap and proactive solution to this problem is to place a clean rock underneath the wheel stand. This weighs down the stand enough so that the wheel is less likely to fall over. Hello Gerbil Lovers! I am very excited to report that we will be having another litter in November that are available for purchase. You can contact us at ohanagerbils@gmail.com to find out more information on our new litter. 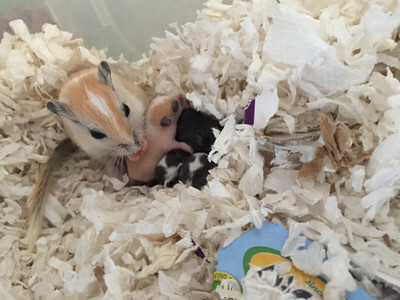 With a small downpayment, you can reserve a gerbil(s) from our upcoming litter. We will be keeping up updated over the summer with tons of pup pictures and more interesting tips. April 21, 2015 - Bonus Tip! Looking for the perfect wheel to give your gerbil? We recommend the Silent Spinner Wheel in size medium. 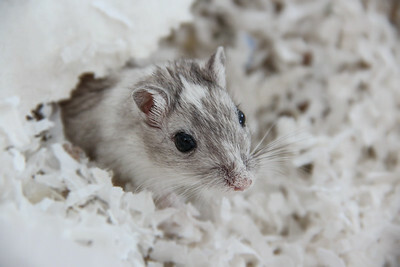 If a gerbil has a wheel that is too small, it can cause chronic pain and back problems. The wheel must be large enough for the gerbil to sit on without having to arch his/her back. 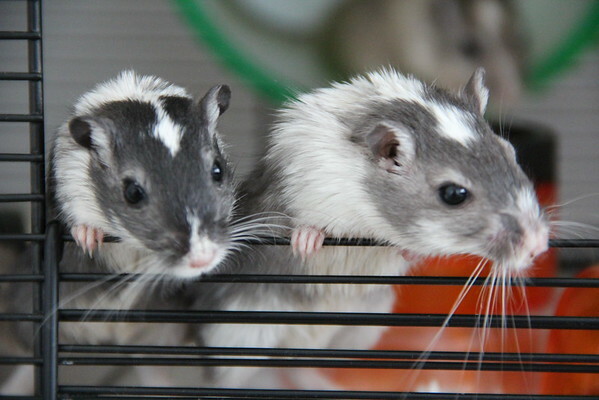 In addition, the wheel must have a flat bottom as wheels that have a wire floor cause many health issues such as bumblefoot (see Gerbil Care). 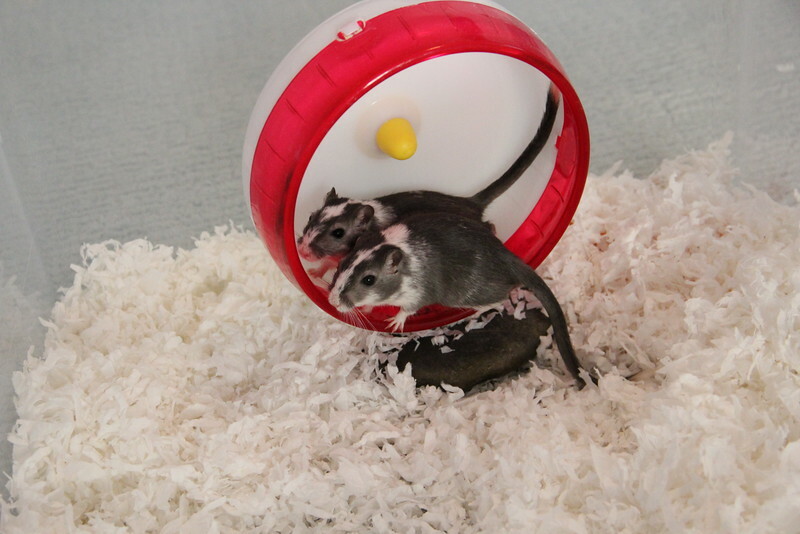 The photo below pictures two recently sold females, Stripe and Princess enjoying their wheel together. Could they get any cuter? April 20, 2015 - Bonus Tip! 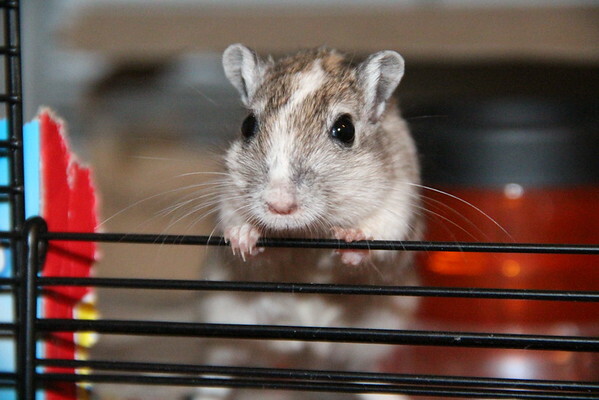 Can't get your gerbil to stop chewing on his cage? Here's the perfect tip to entertain your furry little friend in hopes of stopping him from chewing on the bars, wheels, food dishes, ect. Give him boxes! 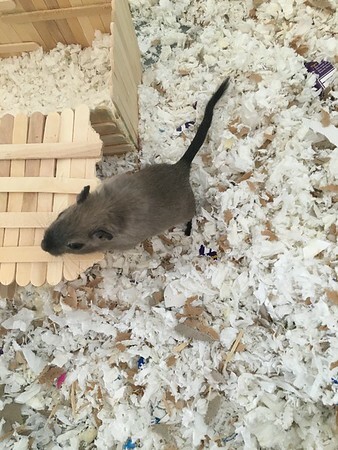 Your gerbil is most likely chewing on his cage out of boredom and loneliness, so give your gerbil extra attention and fill his cage with cardboard, toys, and loving human interaction. 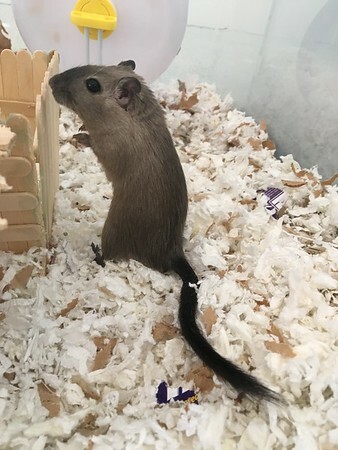 This is your gerbils way of telling you that he needs more attention and activities, so take the hint and allow your gerbil to have some fun! And trust me, your gerbil will show endless appreciation! Hello Gerbil Lovers! This blog post focuses on the color changes in nutmeg gerbils. 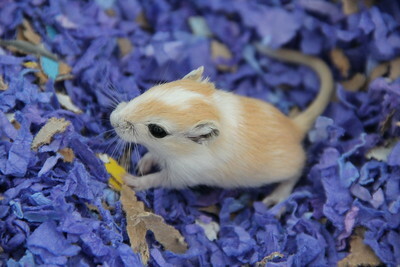 A nutmeg gerbil is born with a bright yellow coat, black eyes, and the same colored stomach. 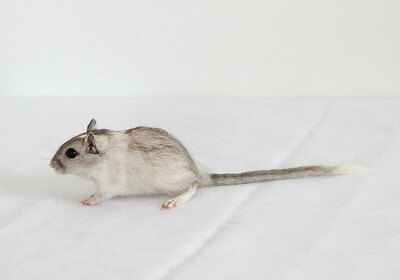 If the gerbil is spotted like the one shown below, the stomach will be white and there will be markings on the gerbil’s face and neck. As the gerbil molts, they will turn into a lovely golden brown with black tips and black toenails. Nutmegs come in all different shades - oily, silver, dark, or light. 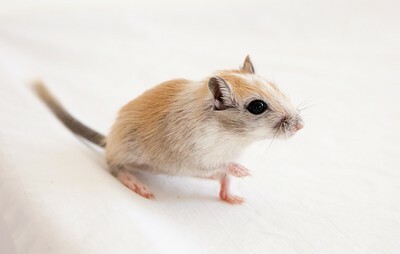 The first part of the gerbil that molts is its tail and haunches, and the head turns color last. Below are pictures of the different stages of gerbil molting! Enjoy! April 5, 2015 - Bonus Tip! Happy Easter! If you want to give you gerbils a little holiday treat, they absolutely love unsalted pumpkin and sunflower seeds. 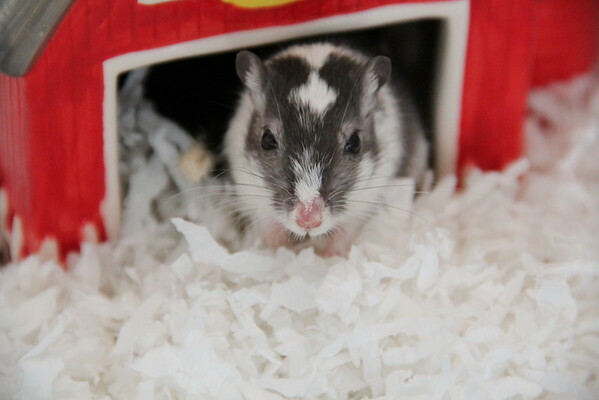 If you purchase the unshelled seeds, it gives the gerbils something to chew on before they get to their treats! Below is Archer eating his first seed! April 4, 2015 - Bonus Tip! 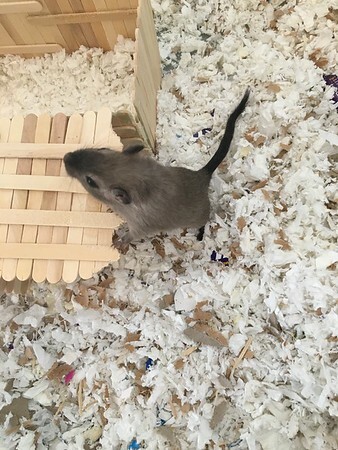 In order to cut down on the expense of litter, let your gerbils make their own bedding! Put a thin layer of litter on the bottom of the cage and then fill it with cardboard, paper towels, and paper plates! You can watch as the gerbils shred the toys to make their own nests tunnels! 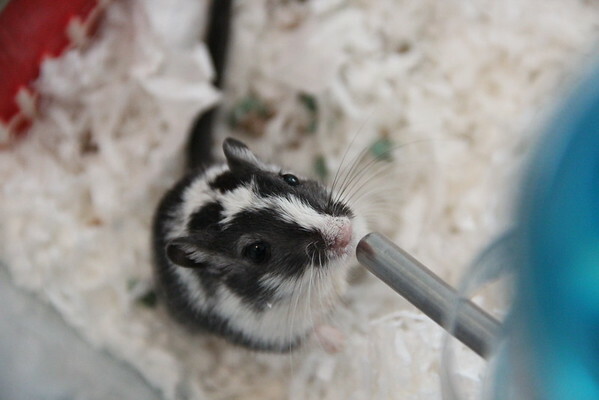 It not only saves litter, but it gives your gerbil something fun and active to do! April 3, 2015 - Bonus Tip! 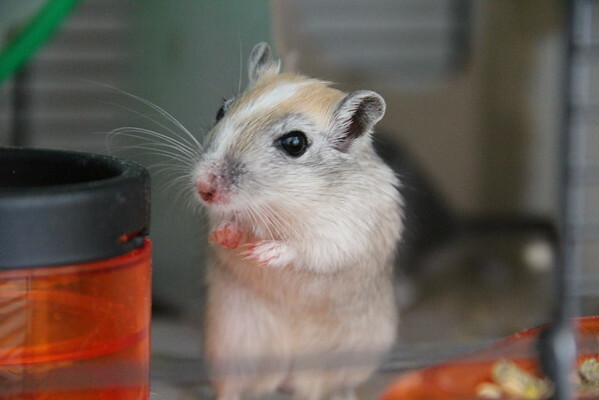 If your gerbils' toenails are getting too long, we recommend putting a clean rock in their cage - I soak my rocks in hydrogen peroxide and then rinse them with fresh water! Place the rock underneath the wheel, by the food, or close to their water, so they're likely to run over it. Long toenails can be very painful to a gerbil so if you feel their nails starting to grow too long, this is the best and most eco-friendly solution! April 2, 2015 - Bonus Tip! Running out of boxes to give your gerbils? Use paper plates! Fold the paper plate so they're three-dimensional and easy for the gerbils to chew. Gerbils love to munching on uncoated paper plates and it's a totally safe and fun way to keep your gerbils healthy and happy!